Caption slip reads: "Photographer: Emery. Date: 1952-03-05. Reporter: Emery to rw. Assignment: Arrival Lt. General Joseph M. Swing, commanding general, 6th Army, Presidio, SF, at Long Beach Air Force Base, for 3-day Southern Cal visit. Welcoming General Swing (at right) to Southern Cal. is Maj. Gen. Wm. 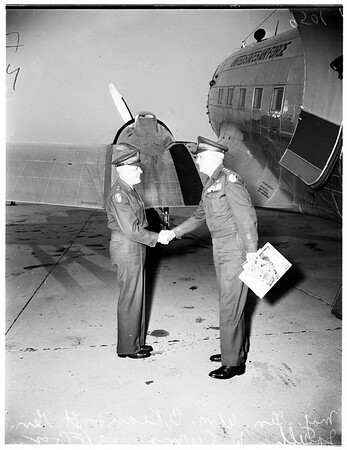 B. Kean, (left) commanding general of 3d Corps, Ft. MacArthur".